Liberty and Justice were cared for by the non-profit American Eagle Foundation headquartered at Dollywood in Pigeon Forge, Tennessee. They became a bonded pair in 1993, after having lived at the Foundation facility for a few years. Liberty, the female eagle, could only see out of her left eye due to a gunshot injury. It is believed that a shotgun pellet hit her right eye, leaving her blind on that side. With only one eye, Liberty was not able to judge distances very well. Therefore, she was unable to catch live prey and was permanently non-releasable. Eagles are predators that are very dependent on being able to see in three dimensions. Liberty passed away June 22, 2011. Justice, the male eagle, was found with shotgun pellets in his left foot and one of his wings. Due to this gunshot injury, he could not fly or grab food well enough to survive in the wild. The feet and talons of an eagle are essential in capturing fish. If a talonned foot cannot tightly grab and hold on to live prey, the eagle could have difficulty catching, killing, and/or carrying its food. Justice passed away January 26, 2011. Liberty and Justice bonded as mates in 1993. They were both very good parents, but their family life had a difficult beginning. In 1994, Liberty laid two eggs, only one of which was fertile. They successfully incubated the eggs and diligently cared for the youngster that hatched. The eaglet was about five weeks old when a terrible thunderstorm came through the area. A bolt of lightning struck their nest, killing the eaglet. Thankfully though, Liberty and Justice escaped being harmed themselves. The 1995 season was not a better nesting experience for the young couple. They successfully produced and raised two very healthy eaglets, but once again misfortune took the lives of their youngsters. At seven weeks of age, only one week before the eaglets would have been transferred to a hack tower for release into the wild, a severe summer heat wave hit Pigeon Forge and other parts of the country. Temperatures reached unusual and abnormal levels. The eaglets overheated and died in their nest. A number of humans also lost their lives as a result of the same summer heat wave. With such tragedy behind them, Liberty and Justice successfully reared from one to three eaglets each year from 1996 through 2004. 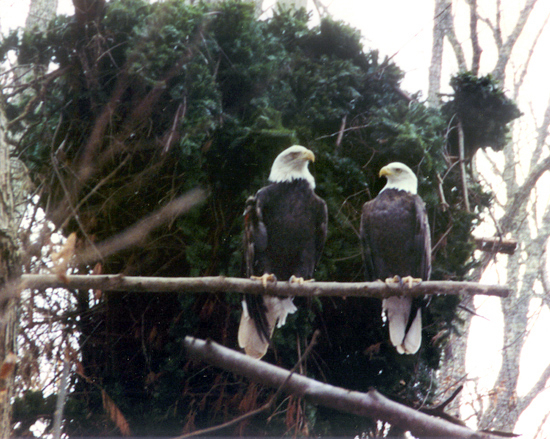 In 1996, they produced two healthy eaglets. In 1997, one eaglet was hatched and released out of two eggs. In 1998, two eaglets were raised and released, and in 1999 they had triplets! These were the first captive-hatched Bald Eagle triplets in Tennessee history and all lived to take their first freedom flight. Liberty and Justice produced two young during 2000, one during each of 2002, 2003, and 2004. Through 2004, they had reared a total of thirteen eaglets. During 2005, they laid three eggs, but unfortunately all three were confirmed infertile. The three infertile eggs were promptly replaced with a 4-week-old Bald Eaglet from the Columbus Ohio Zoo & Aquarium, where one of the adult eagles had just died. Liberty and Justice became foster parents until the eaglet could reach about six weeks age. In 2006, Liberty and Justice laid three eggs, but all three eggs were lost when the nest suddenly collapsed after heavy rains. 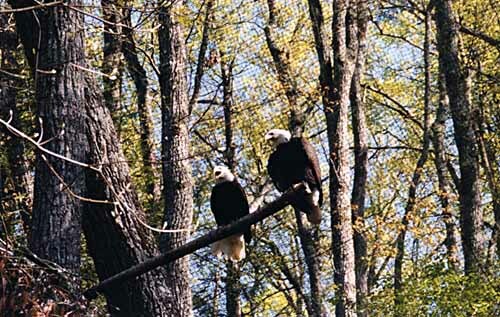 In 2007, one infertile egg was replaced with two healthy eaglets from another AEF nest. In 2008, Liberty and Justice produced one healthy eaglet. In 2009, all three eggs were infertile. From 1996 through 2009, Liberty and Justice successfully reared seventeen eaglets—fourteen of their own, plus three as foster parents. At about six weeks age, eaglets born in captivity, including all of Liberty & Justice’s eaglets, are transferred to an artificial nest at AEF’s Douglas Lake hack site near Dandridge, Tennessee. They gradually adapt to typical eagle habitat, where they can eventually find fish to eat. The eaglets are released into the wild at 12 – 13 weeks age, when they are first capable of flight. After reaching four to five years of age, eagles find mates and tend to return to nest in the general region of their maiden flights. However, if their mate has learned to fly in some other region, they may compromise on a nesting region. Eaglets hacked in Tennessee have been known to nest as far away as northern Ohio. AEF’s hacking benefits thereby spread over a broad region of the eastern United States.